Argentina has given me two of my favorite things. First, one of my favorite people/best friends, Belen. And second, a LOVE for their cuisine. I don’t remember when it happened, but at some point I was introduced to Argentine food and was hooked. First of all, the steak is AMAZING, best steak you’ve had in your life. Then there are empanadas which are just to die for. 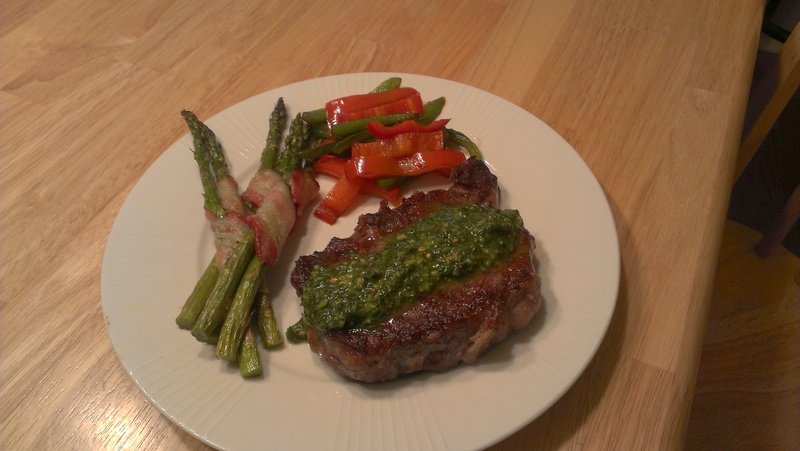 Finally, there is probably my favorite, as in one of my top 5 favorite things of all time, Chimmichurri. I will eat my weight in this stuff. I’ve heard it referred to as “Argentinian Ketchup” but I almost feel that is an insult. Take that not as a comparison to quality, but more so of versatility. You can put this on anything: grilled veggies, bread (one of my favorites), or its (in my opinion) best use, on steak. Put the parsley in a food processor first and pulse it a bit to chop it up a bit. Then throw in everything else and pulse it a few more times to blend. That’s it. This is a GREAT marinade too. Now, I’m not going to talk about how traditional this particular recipe is (it’s probably not at all) but it’s still tasty and much (MUCH) better than the Rachel Ray version I was making before. Summer grilling season is coming up and I strongly recommend trying this on your steak. Posted in 100 New Recipes, Jess General. Tagged with argentina, Food.com, marinade, recipes, sauces.